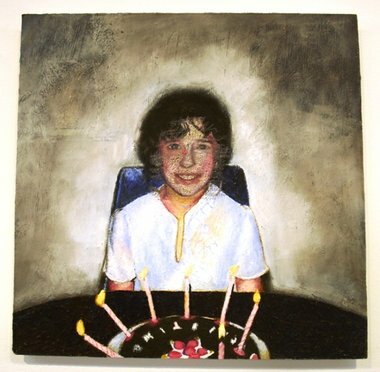 Christine Clark’s latest work is a series of 12 x 12’ oil paintings collectively titled ‘The Birthday Party Paintings’. These paintings are expectantly familiar to all that have celebrated a birthday. They are attentive and considerate to their origins, the photographed family album. Clark has painted more, exposed more than any faithful family photo can reveal. She has a facility to paint what is not easily described in words or can be ascertained within a casually photographed image. She can paint tenderness, transitions, perplexity, and raw tests of relations, the mystification that often encompass childhood feelings. Her paintings celebrate the prosaic as important means to substantiate childhood experiences that are implicit, personal and merged into the blocks of time softened by memory. Clark brings out eclipsed revelations during birthday parties chronicled within 17 square 70s genre paintings. Through time, by the 18th century aristocracy was able to afford cake, but the middle classes eventually adopted the tradition of celebrating birthdays. It seems that so long as there have been calendars, birthdays have been celebrated to commemorate birthdays. Arturo Ricci (Italian), Fredrick Daniel Hardy (English), Walter Osborne (Irish) and Ludwig Knaus (German) painted versions of birthday parties at the turn of the last century – when celebrating a birthday with a party seemed to become an international phenomenon in this cake and candles tradition. Birthdays became feasts to celebrate children royally. The birthday party has been around, as a cultural institution for some time. Photography as a means to document celebrations, substantial events and commonplace circumstances seemed to supplant paintings in the 20th century. By mid 20th century North America everybody seemed to celebrate, at least a child’s birthday, with cake and candles, taking snaps to mark the occasion. Clark’s work is a document to her memories of her familial celebrations recorded through family photographs, painted to accentuate and respond, counter the photographed images, marking the occasions with her bringing forward her understanding and feelings that are unique to painting, visions of time and place through her observations and experiences.